This weekend, it being a little cooler than last, we decided to grill. I pulled out a recipe from my latest issue of Saveur Magazine, Gai Yahng or Thai style chicken with sweet chili sauce. It is basically a cilantro and garlic marinade for chicken, which you then grill. I find gas grills to be banes of my existence, never getting hot enough and making everything taste of propane. I’m of the opinion I may as well just cook on my gas stove on cast iron. We grill with charcoal, preferably hardwood charcoal pieces and not briquets (our grill here, sans optional smoker box). 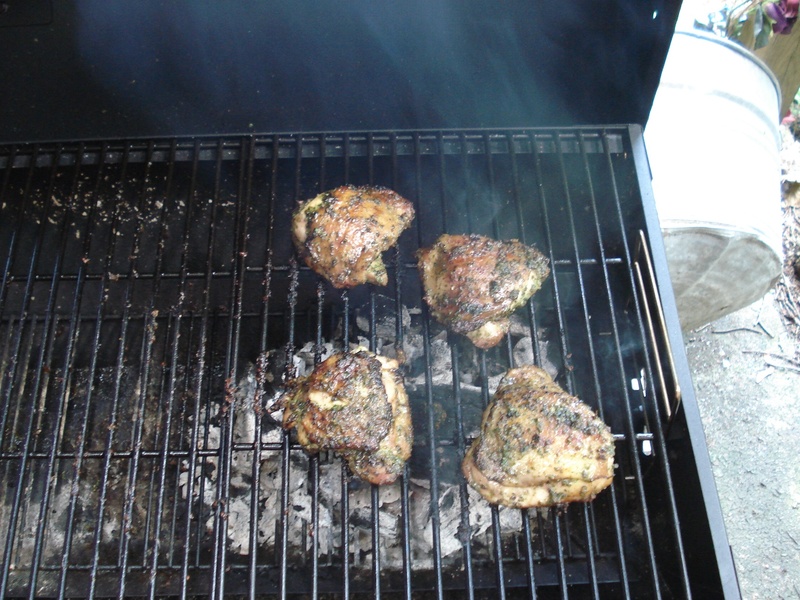 For chicken, I find that indirect grilling works best (instructions here), with the coals under one part of the grill grates and the other side empty. Then you can control just how much heat the chicken gets. It took about 50 minutes to grill 4 fat thighs to an internal temp of approximately 200 degrees F (around 100 celcius). 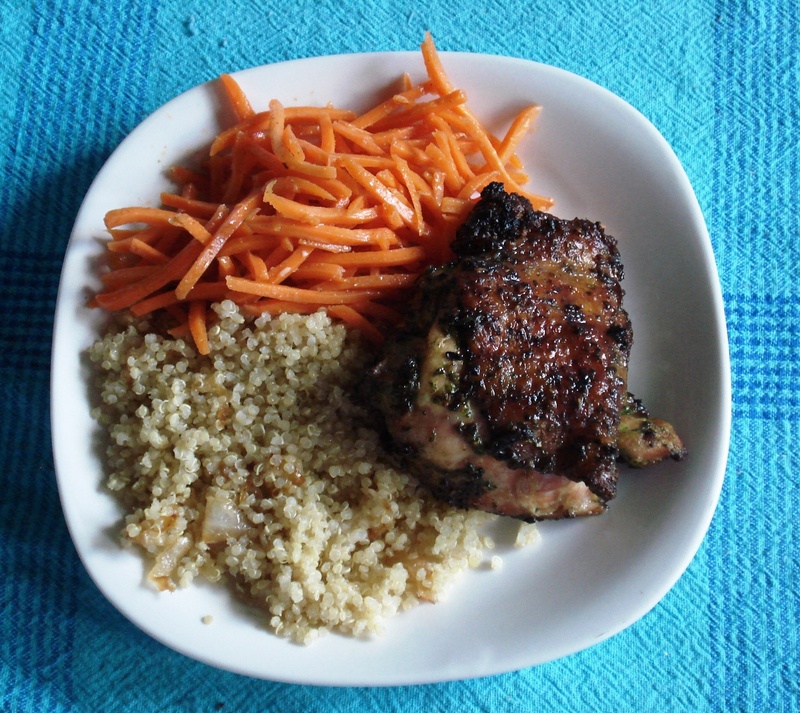 This recipe made some of the best grilled chicken we’ve had in a long time. However, you *must* love cilantro and garlic. I made a basic shredded carrot salad with a basic vinaigrette with cumin, paprika and just a pinch of cinnamon and caynne. Quinoa with toasted onions rounded out the meal. For beverage, we got the new Leinenkugel shandy pack (all cans). They have just come out with an orange shandy to join their already tasty lemon and lemon/berry shandies. The orange has a great but not overly sweet true orange flavor. They *all* went very well with the grilled spicy chicken. They don’t even have the orange on their website yet, so here’s a link to the lemon. The movie for the weekend was Jack the Giant Slayer. I will have to say that I wasn’t expecting it to be very good. However, I thought it was one of the better fantasy movies I’ve seen in a long long while. It had appealing characters, the bad guy gets what he deserves, decent CGI and it was a great deal of fun to watch even for this pair of 45+ year old nerds. Not So Polite Dinner Conversation – Free speech here in PA restricted because God will be offended. Yep, Metcalfe is at it again. Well, there are more amazing attempt to make Pennsylvania a theocracy. Thanks to a friend of mine bringing this to my attention, we now can report on Christians wanting to block free speech because their god will feel bad. Not much of a god if us puny humans can bother a supposedly omniscient, omnipotent and omnibenevolent being. It took some digging for news organizations to find out it was Metcalfe, because the spokesman for the Republican caucus refused to admit who it was when directly questioned; he chose to lie by omission. Unsurprisingly, bullies like Metcalfe are cowards at heard and are afraid of actually defending his actions. So, it’s up to Rep. Metcalfe to defend his poor impotent god because it evidently can’t do anything itself, just like any imaginary being. I guess we’ve come a long way from where this god can actually do something. I seem to recall lots of direct god smiting happening in the Bible if someone was in “open rebellion” of this god, but just like miracles, divine smiting has failed to happen now that we aren’t a superstitious and credulous population. Funny how Daryl isn’t making the same arguments when someone mentions divorce in Pennsylvania. 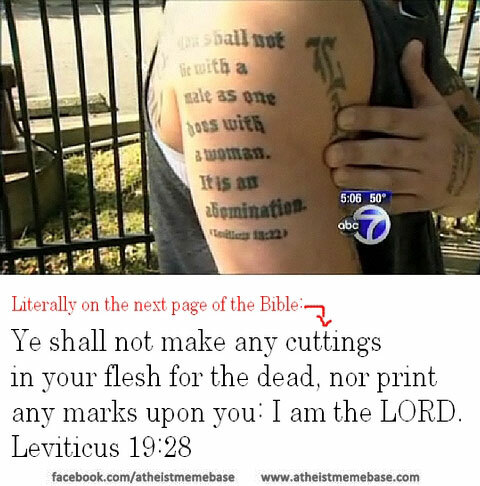 Again, we see one more Christian being a hypocrite, only attacking someone if they ignore the parts of the bible that the Christian finds important. But if this god’s law is something that the Christian doesn’t want to follow, then why they are utterly silent. We should see Rep. Metcalfe demanding that Pennsylvania should not support eating pork. We should see him insist that raped women in PA should be forced to marry their rapists and we should see him insisting that divorce should never be allowed in the Commonwealth, but we don’t. Tsk, Daryl. You want to claim you speak for your god and know what it “really” meant as laws to be enforced. But I know Christians who don’t agree with you at all and who are sure that this god has no problem with homosexuality. Your actions are attempts to silence them too and try to declare that only your version of Christianity is the only “right” one. All without any evidence at all. Hmmm, Rep. Metcalfe, will you meet me on the steps of the state capitol, any day of your choice, and show me that your god is for you and only you? Surely, your god will light a match for you if you just hold it out. That would be much simpler than lighting a whole water-drenched altar for Elijah. But I suspect your faith about that is about as firm as your interest in following all of this supposed god’s laws. You pitiful little hypocrite. Hopefully, every Pennsylvanian, including Christians, will speak out against Rep. Metcalfe attempt to claim to be the only TrueChristian. If they don’t, they are complicit with him in his lies, hate and willful ignorance. Postscript – It seems that not all Republicans are wannabee theocrats and general twits like Metcalfe. Read how decent people behave here: http://www.keystonepolitics.com/2013/06/daryl-metcalfe-is-obviously-an-authority-on-gods-law/ It’s very nice that some apologized to Rep. Sims. Now they need to decry Metcalfe strongly and in public. don’t you loooove the hypocrisy? If it hasn’t started already, we can expect much wailing and gnashing of teeth. Predictions of “Human sacrifice, dogs and cats living together, mass hysteria”. All because the prayers of so many TrueChristians have not been heeded by a imaginary deity and they did not get their way. In case you haven’t heard, the Supreme Court of the US (SCOTUS)has ruled against the federal “Defense of Marriage Act” and has let the lower court ruling stand in the Prop 8 case. Happily, we in the US have moved ahead again with our ideal of equal rights for all. We still have those who want to hide under the skirt of “states rights” to try to continue to allow unequal treatment of citizens under the law. (it’s funny, it seems only awful things are defended when it comes to “states rights”) We still have those who want to claim “religious freedom” for themselves, but who have no problem limiting the religious freedom of others. We still have those who want to keep those they don’t agree with from voting. Those people have lost again. I know that there were many many MANY people praying hard for their god to force the SCOTUS to rule in their favor, on both sides of the issue, though I’m guessing much more magical thinking by silly theocrats. And it seems, as always, there is no god to appeal to. There is no side that has some omnipotent deity on its side where it always wins. 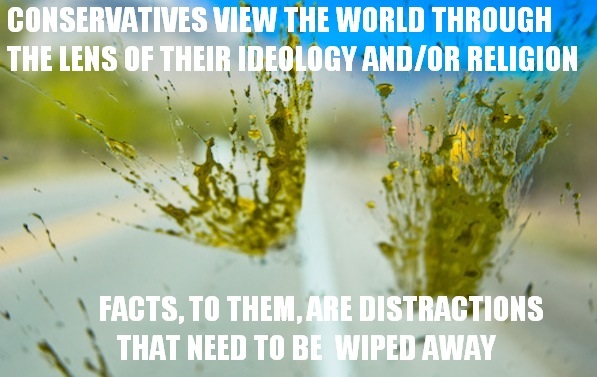 What we do see is that, at least here in the US, we still move forward and nonsense preached from a book several thousand years old will be supplanted by better ideas not based on superstition and ignorance (see slavery). Samuel Smith Strawberry Ale – Samuel Smith, a brewer out of Great Britain, has a line up of fruit beers. This is our last one to try and I’ll have to say all of them are excellent. This one has the intense taste of dried strawberries. There is a lambic tartness and a slight bitter edge. If one doesn’t want something quite so fruity, I think this would be excellent mixed with a light-flavored ale to make a sort of shandy. Out of the fruit beers, I think my favorite is still the apricot and my husband’s is the cherry. Pinkus Hefeweizen – Both of us very much like hefes. This one is a good wheat beer but did not have the banana and clove aromas and tastes we like. Redd’s Apple Ale – This is made by, gasp!, Miller Brewing, one of the mega-breweries here in the States. And I was entirely ready to hate it. But it’s not bad. Very light, not too sweet and built to glom onto the hard cider market. I think this would make a great summer beer, and yes it’s supposed to be drunk cold. For me, preferably from a bottle pulled from a galvanized tub filled with crushed ice! The current meal for leftovers is roast beef. The beef is essentially what we put into the meat pies without being shredded up. The gravy is served with mashed potatoes. Add corn with butter and you have one of my husband’s favorite meals, having grown up on a farm. We both grew up on farms and we always had meat and potatoes, plus corn in season, even if we had nothing else. That also explains why we love silly things like Chef Boyardee pizza in a box as well as Ortega tacos. They were rare, therefore, “special”. When you grow up on a farm, you’ve done the “local food” shtick for years. Just ordered two brewing kits, one for hefeweizen (which we’ve made before) and one for Palmer’s Elevenses (since I’m a nerd and anything that mentions hobbits is fine with me). Look for those in the upcoming months. The Freedom From Religion Foundation (of which I am proudly a member) has helped a woman in her efforts to become an American citizen. Margaret Doughty was pursuing citizenship through naturalization. She hit a roadblock when the US immigration service tried to claim that she needed to join a church, no other religion was mentioned and she had to be “baptized”, to be considered a valid conscientious objector when it comes to bearing arms for the US. It does not surprise me that this was an immigration office in Texas. It may sounds like an unfair stereotype but if there is one thing we can count on, its that religion is much more pernicious in the southern states of the US. This again underlines on how constant vigilance must be kept so we do not lose any freedoms because of creeping theocracy. Today I had to have my one cat euthanized, a polite word for having to have my cat killed because it was the best decision of a lot of bad ones. I’ve read that when one accepts having a pet, one makes an agreement with sorrow. It was our sweet Mordred, who was with us for almost 16 years. He started acting not like himself and that is always a bad thing when it comes to elderly cats. He was diagnosed with pancreatitis, which one of the hallmark symptoms is refusing to eat or drink. The vet gave him some IV fluids and meds to decrease the disease and increase his appetite. But he still refused to eat and drink, except for a few treats, far too few calories to live on. The last two days, we gave him fluids by mouth with a needle-less syringe to keep him comfortable at home for a few more days. Now, we could have had a feeding tube installed, given fluids sub-Q (with a needle syringe under the skin) and kept him alive for a while longer, and he would likely have simply slept most of the time. But that isn’t much of a life, not when he would run away from me when he saw me coming with the supposed “help”. I’ve always been a proponent of euthanasia, that one’s death is just as important as one’s life and life isn’t simply respirating and metabolizing. I’ve believed this as a theist and as an atheist, that life has no innate specialness that should require suffering in its final days. I never accepted that some deity had the only right to kill people, which was probably one of the early signs I wasn’t going to always remain a Christian. But it’s still very hard to let a loved one go, and in my case, it’s much harder to lose my pets than any human that I have cared for. I guess it’s because I’ve chosen to have my pets and they depend on me to take care of them. They understand nothing but that. It would be easy to say “well, I don’t agree with euthanasia this once when it will hurt me personally.” Taking extreme measures could ease the pain that comes from the dreadful responsibility to care for an animal and friend even if that care means that you make his death gentle and peaceful. But that would only be putting off the terrible day for no better reason than my own selfishness. I miss Mordred terribly, but I know that a gentle death is better than a slow fearful starvation. 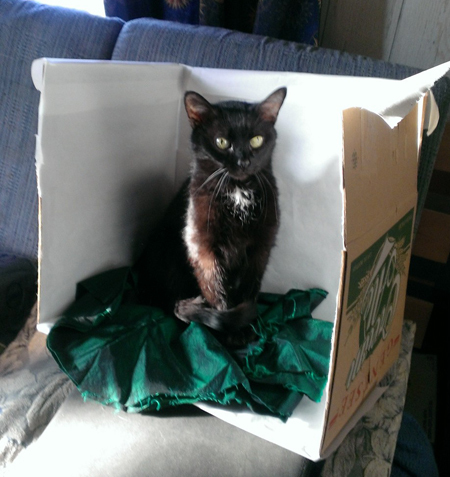 Mordred was a tiny cat, about 7 pounds, and black with a white locket. 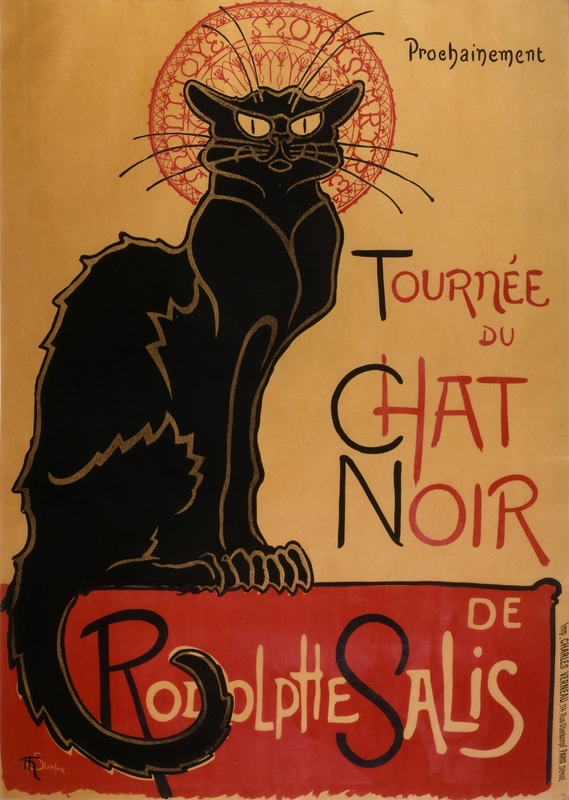 He looked much like the “Le Chat Noir” poster, all scruffy and pure attitude. He was adopted from the local Humane Society and he was probably only about 9 months old when we got him. He was always full of piss and vinegar, making it his business to ambush the other cats, most who outweighed him by at least double his weight. Mordred was quite an acrobat. He once jumped backward from a standing start entirely over a loveseat when he was startled by who knows what. He also made the questionable decision to leap upon a hanging basket (holding plants) that we had just put up in our living room, quickly plummeting to the ground. Needless to say, the hanging basket never was put back up. Much to his disgust, and our amusement, he became a surrogate mother to three of the other cats we have. They were very small kittens when we got them from my parents’ farm. The momma cat had been killed but they at least could drink on their own. They absolutely loved Mordred, always trying to curl up with him. He would growl, get up, move a foot and then settle down again, and was rejoined by the kittens. One of them, Grendel, still loved to do so, even when he was about three times Mordred’s size. In the last year or two, he took to lying on top of our microwave so he could keep me company in the kitchen, being my little kitchen goblin. He also learned to get up there just before I got home from work. When I opened the door, he greeted me with a loud squawk, demanding treats. If treats were not forthcoming, then he would do his best to grab anyone who walked by. Mordred was also often in bed with us, especially during the cooler months. He decided his favorite spot was on my head. For a very small cat, he would take up as much pillow real estate as possible, and then curl around my head. He also had a tendency to sleep with one eye open. It will be a sad and lonely time for my husband and I. And unfortunately, the “kittens” aren’t so young anymore either so it won’t be the last time we know we will grieve this year or the next. It hurts very much, and it is worth enjoying every moment with that which you love to pay for such pain. Don’t figure on some time “later”, don’t regret not doing something now.